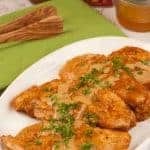 This quick, tangy pan sauce for chicken tenders is made with orange juice, fresh orange segments and jelly or marmalade. We used a good quality jalapeño jelly to give the dish a little kick, but orange marmalade is a great alternative. 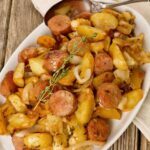 We offer a couple of other variations in the recipe notes as well. 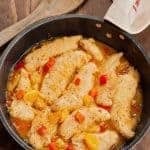 This tangy pan sauce made with fresh orange segments, orange juice and jalapeño jelly turns simple recipe for chicken tenderloins into a quick meal that’s good enough to serve for company. Trim the white tendons from the ends of the chicken tenderloins as needed and set aside. Place the flour, salt and a few grinds of black pepper in a food storage bag and shake to combine. Add the tenderloins and shake to coat them with the flour mixture. Heat the oil in a large skillet over medium-high heat. Add the chicken in a single layer and cook until golden, 2 minutes per side. Transfer to a plate and set aside. Lower the heat to medium and add the onion. Sauté until soft and translucent, 2 to 3 minutes, then add the garlic and sauté 1 minute longer. Add the orange juice and marmalade, and whisk until the mixture is smooth and well combined. 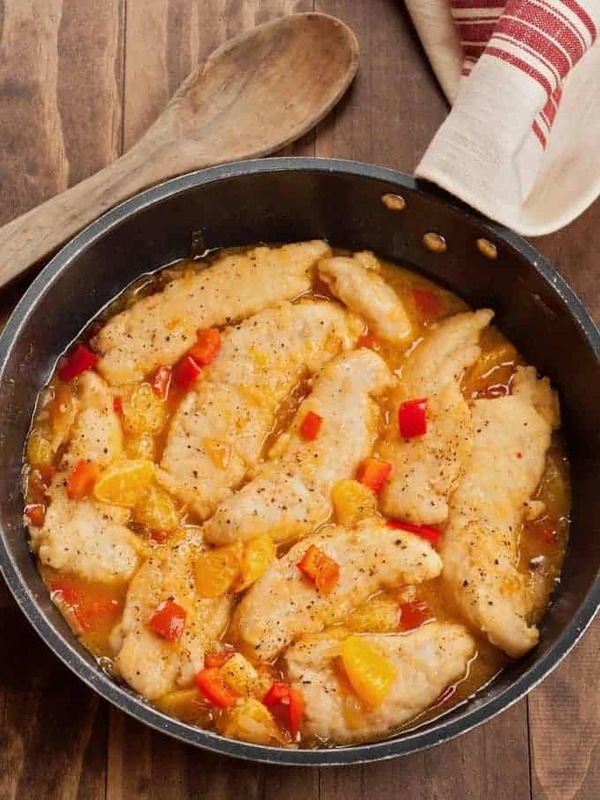 Add the red bell pepper and continue cooking until the pepper is crisp-tender, 2 to 3 minutes. 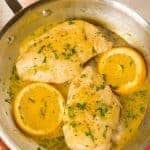 Add the orange segments and cook for 1 to 2 minutes longer. Return the chicken to the pan and turn the pieces several times to coat with the sauce. Continue cooking until the sauce has thickened and the chicken is no longer pink in the middle, about 3 minutes total. 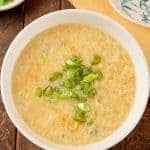 Serve over steamed rice or couscous. 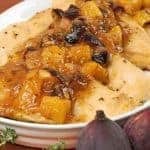 If you use orange marmalade instead of jalapeño jelly, you can add a handful of dried cranberries in place of the red bell pepper to make an orange-cranberry pan sauce. You could also replace the jalapeño jelly with currant jelly, use apple cider instead of orange juice and add diced Granny Smith apple in place of the bell pepper. Went down very well – not used to US terms & measures but got the gist – as we Brits say! Going to do Saratoga lamb recipe – just as soon as I can find a butcher that speaks American. Are people really voting for Trump or is just a joke the US is playing on the world? Glad you had good luck with the recipe. Lime marmalade sounds delicious – I’ll have to try and hunt some of that down here in the states. The cornflour is a good idea too. 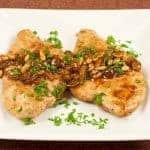 About the Saratoga lamb chops – I was told by the market where I purchase them that they are a boneless chop cut from the blade portion of the shoulder. I’ve always had good luck with them. Lots of flavor. Hope you can find the lamb! 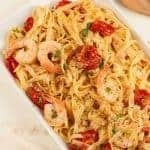 Spectacular recipe for me! I added guava jelly instead of orange marmalade and only 2 tablespoons of it. I only used 2 TBLs of flour for the veggies and 1/4 cup fresca for more liquid. Used 3 clementine oranges. Wow!!! Learning weight watchers recipes and this is the best so far. Lastly – 2 chicken breast from the butcher – lightly sautéed as suggested and my own seasonings. So glad you enjoyed the recipe. The guava jelly sounds good – a little less sweet I think. I’ve used clementines in this recipe a couple of times too – love them.